In this post, we’ve covered how your business can identify vehicle specs by VIN, which specs can be retrieved using a commercial VIN decoding solution, and some of the most common business use cases for identifying vehicle specifications within the automotive industry. Identifying vehicle specs by VIN is as simple as grabbing a VIN number and plugging it into a VIN decoder tool. Some VIN decoding services, typically those designed for commercial use, allow users to submit the VIN pattern (characters 1-8, 10, and 11) as well as the full 17-digit VIN. This feature is valuable for businesses that might not always have full VINs on hand. Businesses working with VINs regularly will want to license a VIN decoding solution that can be integrated directly into their internal system or consumer-facing application(s). This can most easily and efficiently be accomplished using a VIN decoder API. 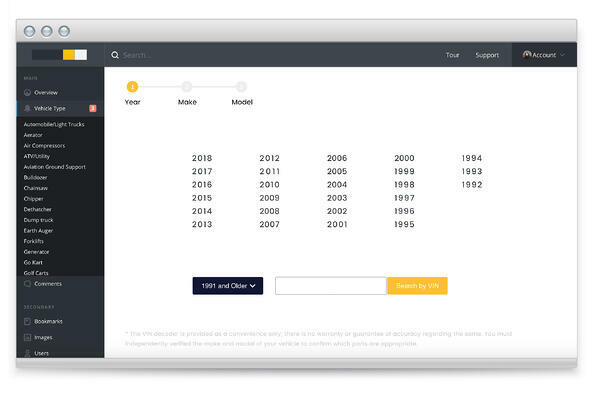 Smaller businesses working with just a few VINs each month might consider purchasing/subscribing to a solution that has VIN decoding functionality baked in. Which vehicle specs can be identified? Whether your business is looking for basic vehicle specifications or a comprehensive dataset with technical specifications, most commercial VIN decoding solutions should be able to identify many of these desired specs from VIN alone. While there is limited information encoded in a VIN, such as year, make, model, vehicle and engine type, manufacturing plant, etc., a complete VIN decoding solution can return many more fields through their VIN explosion process. Basic Data Year, make, model, trim, vehicle type, body type, drive type, etc. Engines Aspiration, displacement, fuel quality, oil capacity, stroke, max hp, max torque, etc. Transmissions Type, gears, availability, etc. Standard Specs Brakes, drivetrain, ext. dimensions, int. dimensions, seating, steering, weights and capacities, wheels and tires, etc. Optional Specs Front tire description, front wheel diameter, rear tire description, rear wheel diameter, tire type, etc. Standard Generic Equipment Audio system, telematics, doors, ext. features, lights, mirrors, roof, wheels and tires, windows, AC, comfort features, convenience features, instrumentation, seats, suspension, airbags, brakes, safety, seatbelts, security, stability and traction, etc. Optional Generic Equipment In-car entertainment, telematics, ext. features, comfort features, convenience features, powertrain, safety, etc. Safety Equipment ABS, airbags, brake assist, daytime running lights, electronic stability control, electronic traction control, tire pressure monitoring system, rollover stability control, etc. Keep in mind that not all specs apply to each make and model, as some vehicle manufacturers allow more customization than others. Additionally, the amount of information that can be obtained by VIN will depend on the data provider. As mentioned, a commercial VIN decoding solution will be able to identify the majority, if not all, of these vehicles specs, while an inexpensive or free VIN decoder will be more limited. Who benefits from identifying vehicle specs by VIN? Automotive retail is probably the broadest of use cases. This is because identification of vehicle specifications by VIN is not only valuable, but essential for any business involved with advertising or selling vehicles, supporting inventory management, providing vehicle research/shopping tools, or retail solutions. Businesses in the vehicle retail space will need to identify all types of vehicle specs including construction, operation, and performance for displaying to consumers via their website or window stickers. The more detailed your vehicle listings are, the greater chance you have of beating out your competitors. Leveraging a VIN decoding solution is the most effective and accurate way to identify these specs. However, it’s important that the VIN decoder you implement can decode more than what’s encoded in the VIN pattern alone. Check out our blog article “Why You Shouldn't Settle for a VIN Decoder That Just Decodes the VIN” to learn more on that subject. Whether generating auto insurance quotes, underwriting insurance policies or submitting claims, a VIN decoding solution will be needed. For the quoting process, it’s important that the VIN decoding provider can support reverse VIN lookup, generating a VIN pattern for carriers from a handful of form field drops downs (year, make, model, trim, body style, etc.). After all, the average vehicle owner will not have their VIN handy when shopping for auto insurance. Identification of vehicle specs by VIN is necessary for assessing the risk of a driver and their vehicle before starting a policy. A VIN decoding solution will assure that your underwriters are utilizing accurate and complete vehicle information. This is especially helpful when determining if the vehicle being insured has preventive safety features installed, such as autonomous braking, blind spot detection, cross-traffic alert, as these features will lower the insurance premium. Here’s are a couple articles to reference from our blog on 1) the value of VIN decoding for the quoting process and 2) the value of VIN decoding for the underwriting process. Fleet managers handle all aspects of vehicle management including vehicle financing, on-going maintenance, vehicle tracking, and insurance. While managing a fleet consisting of a few vehicles can easily be done without a VIN decoding solution, management of fleets much larger in size -hundreds or even thousands- becomes a much more complicated task, especially without the right tools. The ability to pull vehicle specs by VIN for all body styles helps contribute to a well-managed fleet. Vehicle specifications are also important for financing, maintenance tracking, budgeting fuel cost, and other necessary tasks in fleet management. Innovative fleet management companies are integrating a VIN decoder into their software solutions, as it's a quick way to identify vehicle specs and determine the costs associated. Check out our post "Four Benefits of Adding a VIN decoder to Your Fleet Management Software" if you are interested in learning more about implementing a VIN decoder for your fleet solutions. Vehicle transport is another segment of the automotive industry that can benefit from identifying vehicle specs by VIN. Two of the core vehicle specs necessary for transport logistics are knowledge of their weight and dimensions, which are both construction specs. Transport businesses need this data to properly balance loads and to assure that the vehicles being transported will fit on whatever mode of transportation chosen, whether in a rail car, on a ship, or on the back of a semi. Just the VIN is required to access this information when using a VIN decoding solution. Identifying vehicle specifications by VIN also allows transportation companies to quickly quote shipment costs and give proper insurance coverage up front before carrying out the service. This is especially beneficial to the customer service department providing this information to customers. Many vehicle transportation companies realize the benefits a VIN decoder offers in identifying vehicle specs, and for those that have yet to implement a VIN decoding solution, this could be the missing piece of the puzzle. Any type of vehicle maintenance and repair business, whether fixed ops or a private auto body shop, requires vehicle specs for many of their services. Some of these specs may include exterior and interior dimensions, engine details, transmission details, color codes, installed equipment, etc. For shops dealing with a number of vehicle makes and models, or dealership service departments working with an eclectic inventory, having a VIN decoding solution that can provide these specs by VIN will save a ton of time in research as well as support high-quality work. For example, an auto body shop looking to refinish a vehicle or match the paint for a single panel repair job can easily access the exact color code for that year, make, and model using a VIN decoding solution. Some advanced vehicle data solutions will map their vehicle IDs to third-party resources like OEM service schedules and recall information. This is very valuable data for dealers looking to increase customer retention by marketing their fixed ops services, as well as an efficient way to identify important recalls. As mentioned in the introduction, much of this information can be accessed through various resources but can be time-consuming when dealing with a number of OEMs. Most high volume service and repair shops rely on some sort of VIN decoding solution to better maximize productivity. The use of a VIN decoder to identify vehicle specs for replacing parts or vehicle customization is valuable for both the seller and consumer. This might include your local/corporate auto parts stores, like NAPA and Autozone, or tire dealers such as Town Fair Tire and Hogan Tire. A VIN decoder can be used both internally in the store's system or consumer-facing on their websites, in addition to Year Make Model lookup. Most VIN decoder solutions will just cover core specifications data, like vehicle weights, dimensions, fluid capacities, etc., and will generate a vehicle ID that can map to a 3rd party aftermarket parts solution, such as AutoCare Association's ACES. When the use case is just to identify wheel and tire dimensions, a VIN decoding solution might be all you need. For auto parts and tire dealers looking to access this information quickly and accurately for both themselves and their users, plugging a VIN into the system can be the simplest option. Though auto retail, insurance, fleet management, vehicle transport logistics, service/maintenance, auto part dealers are the most common use cases for vehicle specs identification, there are many other sectors of the auto industry that benefit from a VIN decoder solution. If your company operates in the automotive or allied industries, incorporating commercially available VIN decoding can help your company streamline its business processes while increasing the accuracy of vehicle spec identification. To integrate this valuable data technology, you have a couple of options. You can license a delivered VIN database, house it on your own server, and create queries to pull the data you are looking for. Another option is to use a web service or delivered API that will accept the VIN, as well as other inputs, and return the VIN-specific information you are looking to acquire. Both options have their benefits with the web service providing quicker integration and less development on your end. In addition, many businesses choose a hybrid approach and incorporate both delivered data along with a VIN decoder API to meet their diverse data needs.